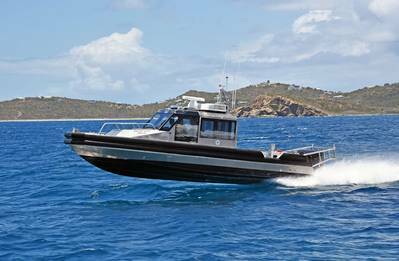 Louisiana-based shipbuilder Metal Shark said it has delivered two custom welded aluminum vessels to the Virgin Islands Port Authority (VIPA). The new vessels, a 45-foot pilot boat and a 32-foot port security vessel, were designed by Metal Shark and built at the company’s Jeanerette, La. production facility. 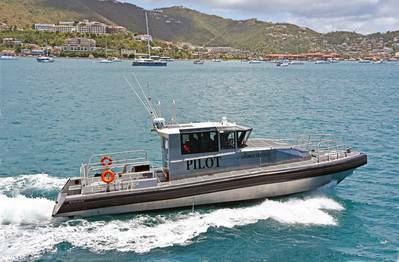 Both vessels were recently delivered to St. Thomas and transferred to VIPA and are now operating from the Edward Wilmoth Blyden IV Marine Facility on the Charlotte Amalie waterfront where they serve the island of St. Thomas and nearby St. John. VIPA has named its new pilot boat George Freeman in honor of its first coxswain, George Elwin Freeman Sr., who worked for VIPA for 33 years until his passing in 2000. The vessel is a 45-foot Defiant-class monohull pilothouse vessel powered by twin Cummins Marine QSM11 diesel engines coupled with Hamilton HJ322 waterjets. The 45 Defiant Pilot demonstrates pinpoint maneuverability while delivering a cruise speed in excess of 30 knots and a top speed in the 40 knot range, the builder said. Metal Shark said the vessel’s climate-controlled pilothouse features its signature Pillarless Glass for improved visibility, in a reverse-raked arrangement developed by Metal Shark with input from numerous pilot groups. Visibility is further augmented by the vessel’s elevated, centerline helm position. Large opening side and aft pilothouse windows and a wireless crew communication headset system facilitate crew coordination during pilot transfers, and large overhead skylights provide upward visibility while approaching and operating alongside moving ships. The vessel features fully flush non-skid decks, handrails inside the cabin and on deck, low-level LED pathway lighting, a large functional swim platform, plus easily accessible Jason’s Cradle, dive ladder and throwable life rings. A urethane-sheathed, closed-cell foam Wing collar provides durable and resilient fendering. Shock-mitigating seating has been provided for a crew of five, and anti-fatigue floor covering has been provided in the pilothouse and the belowdecks crew spaces. Additional features include a galley, enclosed head compartment, v-berth and large walk-in mid-cabin storage compartment. For its new port security patrol boat, VIPA selected Metal Shark’s 32’ Defiant powered by twin Evinrude E-TEC G2 300HP outboard engines. The vessel cruises at 35 knots and achieves top speeds approaching 50 knots. Funded in part by a FEMA Port Security Grant, the vessel has been outfitted with a positive-pressure Chemical, Biological, Radiological, Nuclear, and high-yield Explosive (CBRNE) crew protection system to assure safe and uninterrupted operation in a wide range of disaster response scenarios. Like its larger 45’ pilot boat sibling, VIPA’s 32’ port security boat features Metal Shark’s pillarless pilothouse glass to reduce blind spots. Shock-mitigating seating has been provided for a crew of four inside the vessel’s climate-controlled cabin.